As an unprecedented 40,000 Palestinians in Gaza marched for the right to return, marking the one-year anniversary of the beginning of weekly such marches, Israeli snipers shot into the Gaza Strip, killing four youth and wounding at least 207. The Israeli army uses military-grade tear gas on the crowds, and the tear gas cannisters fired into crowds often hit individual, killing them or causing severe injuries. Lazy journalists keep talking about border "clashes," but most of the thousands of Palestinians wounded in the past year have been shot on Gaza soil at a distance from the fence. 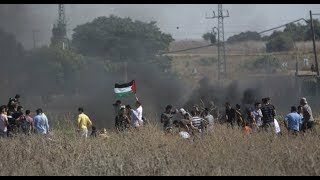 Although the Israeli Army propaganda arm attempted to imply that the sniper fire was justified because thousands of Palestinians rushed the border fence keeping them imprisoned in Gaza, the very picture the army included showed that the masses of protesters were well back from the border and just a handful of young men were ineffectually throwing stones in the general direction of the Israeli army line, which they could not reach. Folks, look closely at this video. It clearly shows not 40k but 8-10 people actually "challenging" Israel at the fence, not launching explosives or shooting guns but picking up stones & throwing them, in a profoundly futile gesture given Israeli forces are far back & armored.